There is a certain sense of almost fantastical fascination when it comes to the popular scope of Samurai warriors. But if we dissociate popular culture from historical analysis, we must understand that not all medieval Japanese warriors were Samurai. More importantly, not all Samurai were warriors themselves; some of them were also men of letters, artists, and even farmers. In essence, the origins of the Samurai come from a class of people (comprising the upper section of the Japanese society) that morphed into a military culture over the course of centuries. By the 17th century Edo period, this class was often counted as the highest element of the Japanese social hierarchy of shi nō kō shō. In the realm of etymology, as historian Anthony J Bryant noted, the very term ‘samurai’ comes from an obsolete verb saburao (or sabura[h]u), which roughly means ‘to serve’ or ‘to be in attendance’. But the Samurai we would talk about in the article (and general notions pertain to) were more akin to the bushi, an older Japanese term for the feudal warriors, thus making these terms (generally) interchangeable. 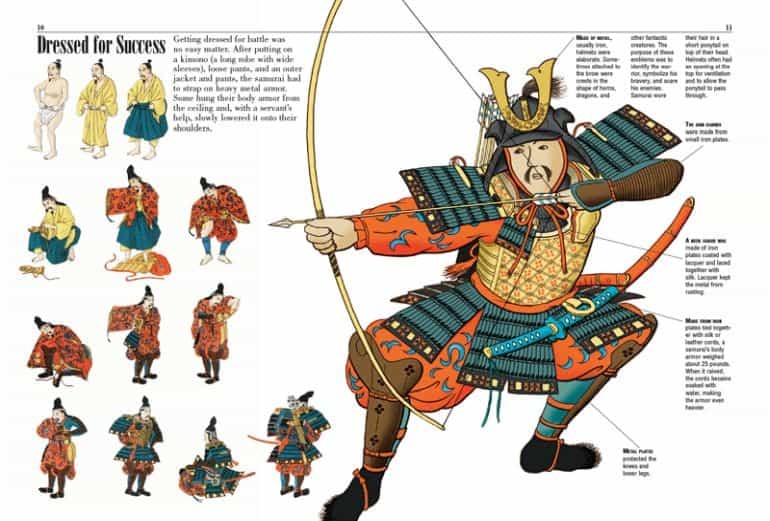 And talking of feudal characteristics, if we put forth a familiar analogy, the Samurai were partly similar to the Knights in terms of social and military status, although their approach to warfare greatly differed in tactics and preparation. The Japanese Imperial line, although achieving a nigh mythical status before circa 550 AD, gradually delved into being a puppet entity largely controlled by powerful families like Fujiwara by the 7th-8th century. Scholars have noted the possibility of how China-inspired Buddhism took hold of this elite section (by achieving dominance over the native Shinto-based adherents), thereby replicating the Imperial Palace machinations of China. However, beyond conjectures, what we know is that political circumstances of the time contributed to an enfeebled line of namesake young ‘Emperors’, who in reality were controlled (and even dismissed) by the influential families of Kyoto – the Imperial capital of Japan. Moreover, we should also note that by 9th century AD, Japan was culturally united, with the northern tribes already subjugated by the earlier generations of Imperial authority, which ironically eroded their ‘need’ to exist as true power-wielding entities. On the other hand, an unforeseen effect of this weakening of the Imperial authority resulted in the divergence of power to different parts of the Japanese realm. Simply put, prominent families, based away from Kyoto, started to exert their political influence in proximate areas that sometimes even rivaled that of the Imperial court at Kyoto. Consequently, the 11th century saw numerous civil conflicts and wars between such familial entities, thereby fracturing Japan into feudal domains. The Samurai or Bushi emerged as the provincial warriors of such feudal engagements, thereby establishing their martial prowess and affinity all throughout Japan. Furthermore, as members of a high social class, they often functioned as full-time soldiers loyally tied to the powerful leader – thus once again (coincidentally) mirroring the relationship between the knights and their lord. The very title shogun is derived from seii taishōgun, which translates to ‘barbarian-quelling generalissimo’, the highest rank offered to the military commander during the Imperial authority’s campaigns against the northern Ezo (Emishi) tribes. Over time, due to the aforementioned effects of the decentralizations, the title was appropriated by leaders who took over the military institutions of Japan, thus effectively controlling the government (in spite of the Emperor’s will having legal precedence over a Shogun). In circa 1185 AD, Minamoto Yoritomo, the titular head of the powerful Genji clan, is often perceived as the first to establish a Shogunate or Bakufu in Japanese (translates to ‘tent government’), thereby combining the mobile and military aspects of the government that would supersede the numerous (and rather convoluted) civil authorities like the kanpaku – a title equivalent to a prime minister. Also known as the Kamakura Bakufu – since it was based in Kamakura instead of Kyoto, this shogunate, while theoretically upholding the power of the Emperor, went on to methodically dismantle the influence of the Imperial court of Kyoto. Yoritomo, himself regarded as a capable administrator, also delegated some of the ‘political muscle’ to the provincial parts, thereby creating a feudal state with nascent central authority. Consequently, the Shogunate evolved into a bureaucratic apparatus that in reality took over the reins of power from the Emperor, while also endowing more political autonomy to the provincial military leaders. Over time, the shogun became hereditary in nature, while the political scope was shared by military lords (or shugo) known as the daimyō, who went on to exercise both territorial control and proprietary rights. These daimyo lords, who later became the military governors and clan leaders (by the 16th century), formed the feudal bastions that incorporated the retinues of Samurai – who were increasingly becoming militarized in their outlook. By the late 12th century, another Japanese militarized faction incredibly pertained to the sōhei (or yamabushi), the zealous and psychologically-intimidating Buddhist ‘warrior monks’ who took part in various inter-monastery and feudal encounters. The 13th century Samurai approach to warfare can be encapsulated by their reaction to the attempted Yuan Mongol invasion of Japan in 1274 AD. 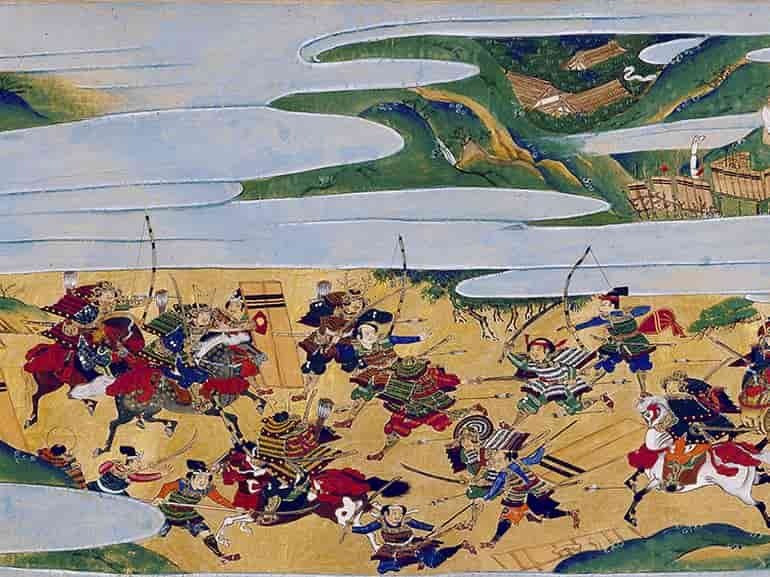 According to historian Anthony J Bryant, the fringe islands on the way to Kyushu rapidly fell to the Mongol onslaught, and the defending forces were awestruck by the enemy’s mode of warfare. To that end, the Samurai, by virtue of relatively low scale conflicts in medieval Japan, often focused on the individualistic side of warfare entailing duels and honorable actions. In contrast, the Mongols were masters of conducting large scale invasions involving massed formations and collective tactics. 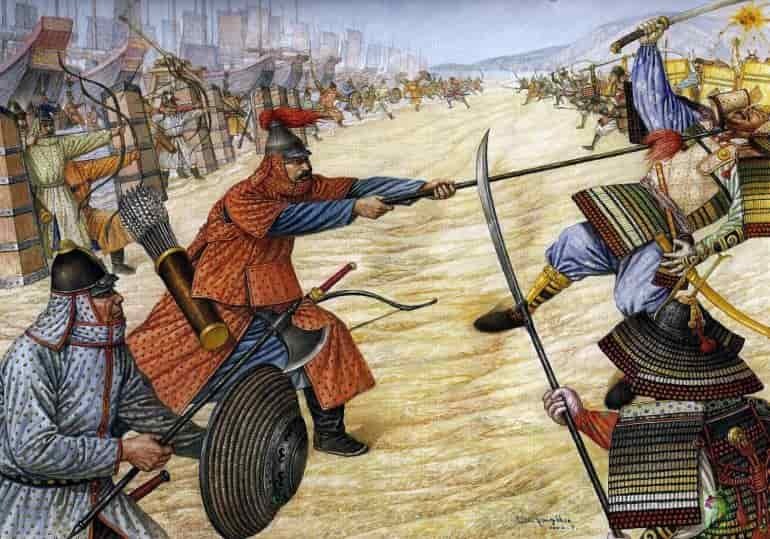 In spite of such overwhelming differences, the Japanese forces bolstered by smaller Samurai contingents did manage to hold off (albeit temporarily) the mixed Mongol, Chinese, and Korean forces at Kyushu, sometimes even by adopting deviceful maneuvers like night raids. The ‘rest’ was done by a fortuitous typhoon that crippled the Mongol fleet, and thus the remaining invaders had to unceremoniously return to the Chinese mainland. However, a second (and much larger) Mongol invasion fleet, divided into two, was gathered in 1281 AD, and it possibly contained 900 to 3,500 vessels (with troops numbering somewhere between 14,000 to 70,000 – in accordance with modern estimates). And while the Japanese anticipated a second attack on their southernmost island, their own numbers were barely sufficient for containing even a fraction of the force of such a magnitude. But this time around, the outnumbered Samurai showcased even more resilience in the disparate beach encounters, encouraged by focused counterattacks and small coastal defenses. Nevertheless, it was fortune that overshadowed heroic defense, with the weather pattern once again playing its instrumental role in saving Japan – this time in the form of a massive typhoon. Given the moniker of kamikaze – ‘divine wind’ or ‘spirit wind’, the storm battered the Mongol ships by dashing most of them against the coastal Kyushu rocks, possibly resulting in over two-thirds casualties for the invading army. The definitive armor of the 10th-11th century Samurai pertained to the Ō-yoroi (‘great armor’), while their primary weapon possibly entailed the bow. The ō-yoroi was generally composed of lamellar cuirass divided into three conspicuous tassets (kusazuri), and as such was reserved for the high-ranking warriors – when such elite troops performed the tactical tasks of cavalrymen and mobile archers on the battlefield. 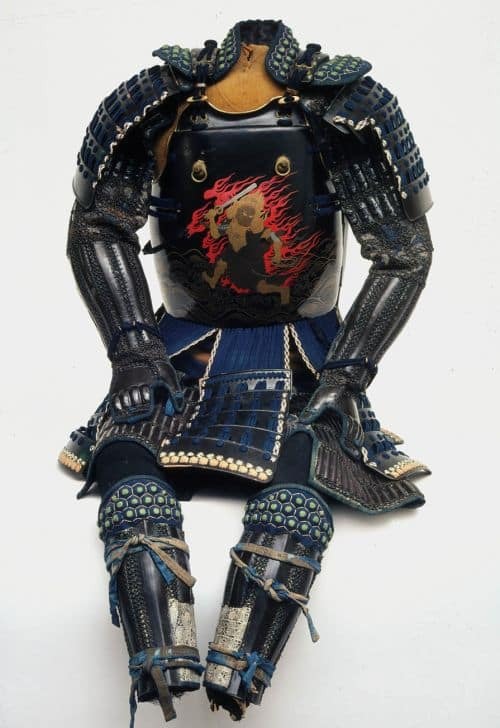 This entire panoply, with its leather finish egawa, weighed over 65 lbs, and was complemented by the mengu facial armor and kabuto headgear that were either crafted from iron or lacquered leather. But as always genuine practicality triumphed intricate style, and thus by the Kamakura Shogunate Period (1185 – 1333 AD), the higher ranking Samurai were gradually beginning to adopt the lighter armor of their lesser infantry brethren. Inspired by the one-piece do-maru (‘torso round’) and the harakami-do (‘belly-wrap torso’), most of these warriors opted for the hara-ate (‘belly protector’) – offering greater comfort and flexibility, which in turn alludes to the changing roles of the Samurai on the battlefield. In essence, as opposed to ceremonial duties expected of high-class retinues with fashionable armor, the Samurai were now actively taking part in their military duties associated with feudal warfare. By the late 14th century, even the nobles, in spite of their perceived etiquette (when it came to battle attire), began to wear the do-maru and the harakami-do. 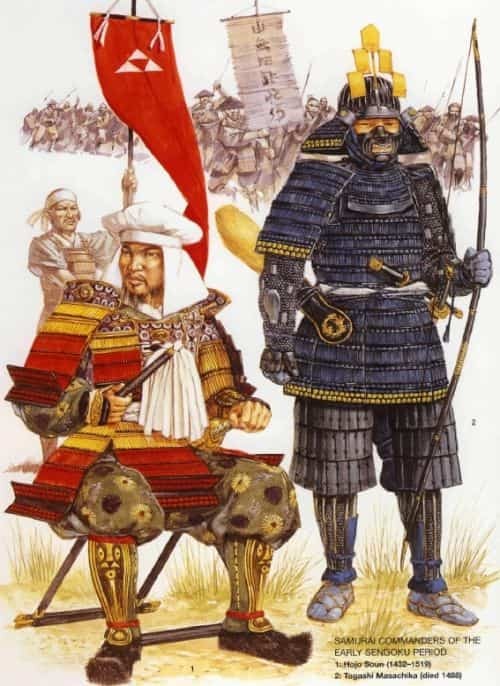 During the early phases of the Ashikaga Shogunate (circa 15th century), they however still flaunted their sode (extensive shoulder protectors) as ‘markers’ of high class, while a few continued to use the almost-anachronistic ō-yoroi as means to represent their eliteness. Till the early 16th century, the Samurai, while existing as a distinct class, was still perceived as being ‘accessible’ to the lower status members of the society. To be accepted as a Bushi warrior, one had to prove his mettle in numerous battles while also maintaining some form of connection (or reverence) for his daimyo lord. In this increasingly hierarchical system, the ashigaru (‘light feet’) infantrymen formed the lowest rung of the fighting class, and few of them could hope to achieve the status of Samurai based on their battlefield exploits. However, during the latter part of the period known as the Sengoku Jidai (‘Age of Warring States’ – 1467-1600 AD), roughly between 1550-1600 AD, the Samurai became increasingly feudal in both their outlook and structure. The epoch in itself was marked by near constant state of warfare, political intrigues, and ultimately a social change in the Shogunate. And quite ironically, Toyotomi Hideyoshi, the man who brought about the most flourishing changes to the cultural sphere (in the latter half of 16th century) and who was himself born as the son of a farmer ashigaru, limited the ‘access’ of the poorer sections to the Samurai class, thereby formalizing a rigid hierarchy of military and civil avenues. In essence, the Samurai, by the late 16th century, was declared as a strictly social class – as codified by numerous edicts pushed forth by Hideyoshi and the succeeding Tokugawa (or Edo) Shogunate. And this class, with its own pecking order starting from the rich landholding daimyo (basically military governors and clan leaders) to the younger bushi, was the only one allowed to bear arms. Simply put, the Samurai, as opposed to a military force, was transformed into a military caste – regardless of whether its members were warriors, artists or men of letters. To that end, the women born into the caste were also perceived as ‘Samurai’, with some of them even trained in the use of dirks and halberds (naginata) for guarding the inner sanctums of castles and courts. This feudal scope, partly inspired by the Confucian ethic of rigid social structure (as noted by historian Anthony J Bryant), was depended on the inter-reliance between the lord and his retinue. In fact, having a lord was rather flaunted as a marker for the high status enjoyed by many a Samurai, and thus being lord-less signified their relegated status as rōnin (‘wanderers’ or ‘wave person’). 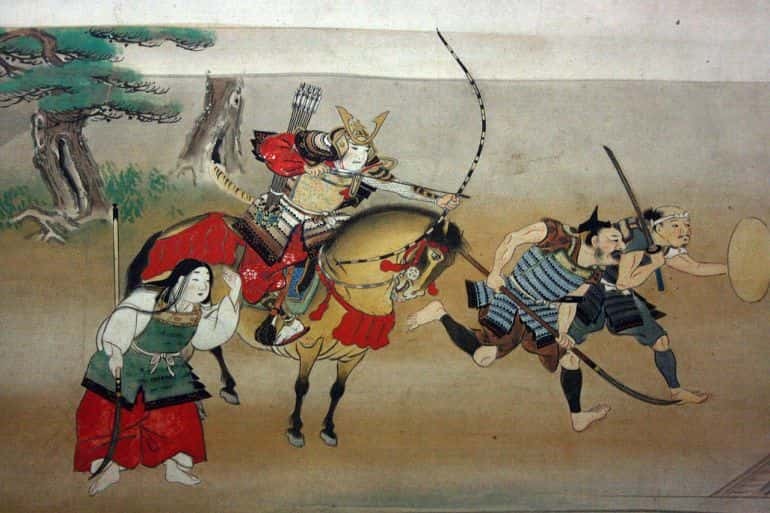 The rōnin often served as mercenaries, while few of them even resorted to banditry, with the latter fate rather alluding to their loss of prestige by virtue of their loss of the leader. As for the conventional Samurai, they were allowed to settle inside the estates of their lords with their own households. These warriors, while generally equipped by their lords, were paid stipends in the form of koku – a unit of measurement that entailed the volume of rice consumed by a man for an entire year; with one koku possibly being equivalent of 120 liters. In that regard, the lesser Samurai were paid a little less than a koku (in addition to the food supplied by his lord), while the castle commanders enjoyed benefits of hundreds of koku (from their immediate daimyo governors) that were used for not only paying their garrison Samurai but also the numerous servants and other non-military retainers. 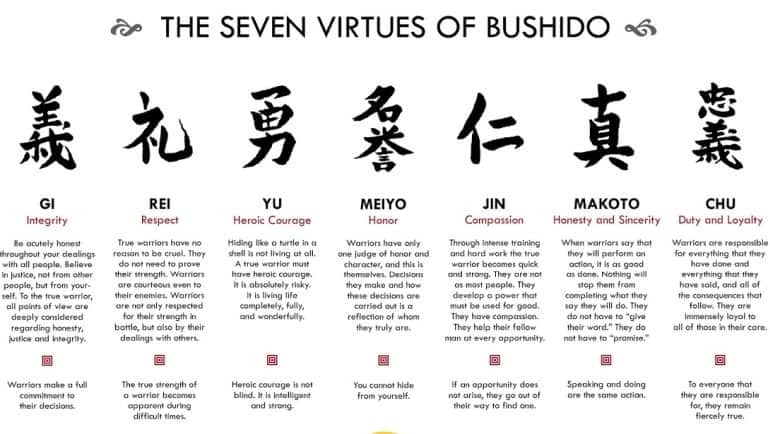 Bushido, derived from bushi (warrior) and dō (way), translates to ‘way of the warrior’, and such signifies a collective code of conduct aimed towards the Samurai class. And while parts of this ethics-based scope, further amalgamated with Confucian ideals, was only formalized during the Tokugawa (or Edo) period after 16th century, the various attributes and morales mentioned in the Bushido have older origins, perhaps dating from a time (circa 8th century) even before the emergence of Samurai as a military class, thus suggesting how Japanese literature always had a fascination with the romantic notion of a warrior-poet. Pertaining to the last part, the Bushido, after post 16th century, was indeed compiled as a manual that directed the Samurai to be the cultured ‘gentlemen’ of the period with chivalrous attitudes. But even beyond the call for cultured mannerisms and perceived righteousness, the core tenets of the warrior code related to loyalty, courage, honor, and self-control (or even self-denial in some cases). Coming to loyalty, unsurprisingly, the Samurai being the archetypical Japanese warrior, was expected to be unflinchingly loyal to his lord, daimyo, and household, irrespective of the political and military situations. Similarly, relating to courage, the Samurai was taught not to fear death but to only fear dishonor. As for the ambit of honor, it is aptly espoused by the famous story of the 47 ronin (masterless Samurai), who after avenging their fallen leader, ritually commit suicide (seppuku – talked about later in the article). And finally, as for self-control and self-denial, the Samurai, as practicing Buddhists, had to look forth to the fatalistic scenario of ending up in hell, irrespective of their perceived virtues, since their duty as feudal warriors entailed fighting, violence, and killing. In spite of such a foreboding ‘future’, the Samurai were expected to be frugal and disciplined with intended denial of excesses in life. The Samurai training was more akin to the Spartan agoge rather than medieval European knights since its aim was to inculcate discipline and aptitude both on the mental and physical level. To that end, most children of the Samurai were seen as future warriors and thus their training started from the tender age of 8, wherein the boys were prepared for teamwork and synergistic activities, while individualism and self-obsessive traits were resolutely discouraged. In fact, conformity was such a crucial part of the rigid 16th-century Japanese society that even left-handedness was seen as a weakness, and as such the ‘southpaws’ had their left hand tied (when given tasks) to break the ‘habit’. By the age of 12, the child was already expected to have sufficient knowledge and practice of selected academic subjects, musical instruments, and martial training. In fact, by 13, the young teenager was already perceived as a Samurai ready for battle. 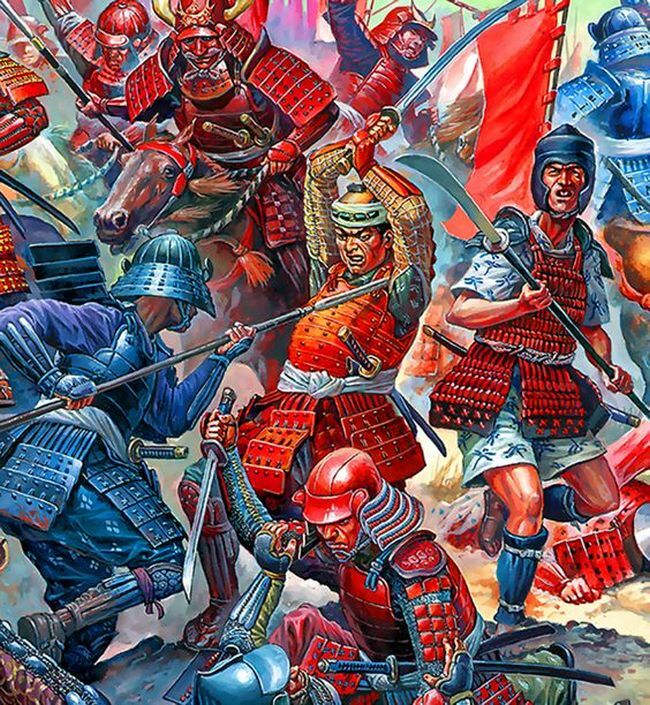 The reason for the initiation of such young boys into brutal battle scenarios is alluded by the Age of Warring States, a more than a 100-year long period of near-constant warfare in Japan. Simply put, the rapid and chaotic scale of the military actions rather compelled the young Samurai to survive and ‘learn’ both weapon-skills and tactical maneuvers from rigorous real-time scenarios. Of course, this was not a standard situation for every Samurai. Some clans headed by their resourceful daimyo often incorporated pragmatic training methods that were demonstrated and practiced inside dedicated dōjō (schools for martial arts) headed by veterans. One pertinent example would relate to a form of wrestling in full armor for increasing the stamina and capability of the young Samurai in melee situations. Other more ‘exotic’ training involved violent sports like practicing archery on horseback with live targets of wild dogs. After the training period was over or the Samurai boy attained a certain age (13 to 15), he was ritually inducted into the Samurai ranks through a ‘coming of age’ ceremony known as the genpuku (or genbuku). One of the primary customs involved the shaving of the pate while being given the characteristic topknot and an adult’s cap. For the noble houses, the ceremonial cap was replaced with a full suit of armor, with the genpuku being held before the commencement of a battle – thus heralding the young teenager’s rite of passage as a ‘debutant’ warrior in real-time scenario. The genpuku was also held for Samurai girls, with the young lady having her eyebrows shaven and teeth blackened with an iron-oxide compound. The latter custom also alluded to her status as an upper-class bride-to-be for forming alliances with other high-ranking houses. By the early 1500s, the do-maru was further modified as the Mogami-do with solid plates, and this became the template for Samurai armor for at least the first half of the 16th century. By the later half, yet another innovation in armor-making came forth in the form of the okegawa-do (‘tubesided torso’), a cuirass replicating clamshell design – and this template with its many variants became the standard protective gear adopted by the Edo period Samurai. Interestingly enough, when it comes to the origins of this clamshell armor, there are conjectures floating around in the academic world relating to how it was possibly influenced by the Portuguese (who first arrived on Japanese shores in circa 1543 AD). Another hypothesis relates to how the armor, by virtue of its relatively shot-proof nature, was an evolutionary answer to gunpowder weapons. The 1550s also saw the development of the effective three-plate zu–nari (‘head-shaped’) kabuto, with the simplistic design given cosmetic overhauls (like fearsome visages, tall court caps, animal heads – made of lacquer, wood, and papier mache) for the Samurai elite. By this time, the Samurai lords and officers also made use of datemono (crests) on their kabuto to show their hierarchical ranks on the battlefield. On the practical side, the curving shikoro (extending rear neck guard) was made more tight-fitting that not only made the wearer more comfortable but also even distributed the sheer weight of the kabuto from the head to along the spinal region. Daisho pair. Source: SamuraiSwords (link here). While in popular culture katana is represented as the preferred weapon of the Samurai, it was the bow rather than the sword that distinguished the early Samurai (in the 9th-10th century) from the other soldiers. To that end, the Japanese bow (yumi) was often of considerable length (7 – 9 ft) and of composite construction with bamboo strips laminated over a wooden core, which was then lacquered for the finish. The specialized archers used the Mongolian draw with thumb and forefinger, as opposed to the European draw. 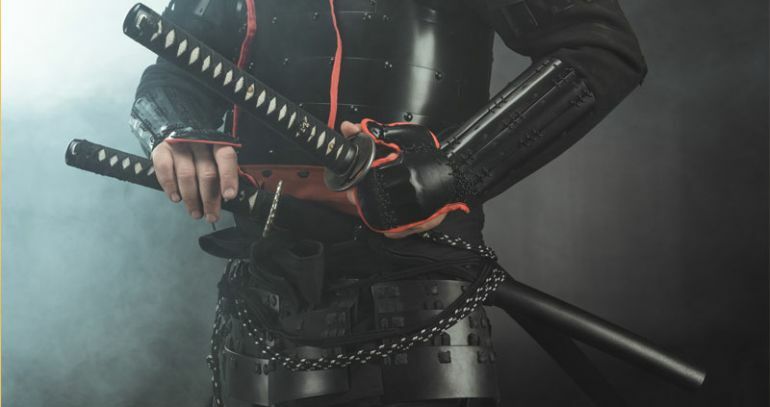 It should be noted however that the bow was always accompanied by the sword of the Samurai, specifically the longsword known as tachi – basically the precursor to the famous katana that was suspended from the waist. Some of the warriors also carried a shorter sword known as the uchigatana, and this became the ceremonial sword for the Samurai when not in armor. By the 1550s, mirroring the social change and the evolution of armor and tactics, the now increasingly feudalistic Samurai adopted the renowned katana as their primary weapon, and this longsword was often paired with the tantō (‘short sword’) or the wakizashi (‘companion sword’ – a shortened version of the earlier uchigatana). In fact, the katana (or daitō) along with a shorter sword was showcased as a paired ensemble known as the daishō (‘big-little’), and this became the identifying motif for the Samurai in the 17th century. Simply put, by the aforementioned period, these warriors were the only ones in the Japanese society allowed to carry and flaunt the pair of blades. Suffice it to say, the swords were of exceedingly high quality with their arrangement of flexible layers encasing the core of strong, hard steel. As historian Anthony J Bryant commented – “[Japanese blade] is perhaps the finest non-surgical device ever made”. Beyond bows and swords, the typical weapon associated with the late medieval Japanese warriors pertains to the yari (lance), that was incredibly used by both the infantry (as a standard weapon) and the cavalry (as a specialized weapon) – and the instrument, with its heavy steel lancehead (of variant types) and triangular cross-section, was usually constructed from laminates of bamboo strips. And lastly, the seemingly antithetical weapon of the both the Samurai and the ashigaru infantrymen pertains to the teppô (‘iron cannon’, also known as hinawajû or ‘fire rope gun’), the Japanese matchlock guns inspired by the Portuguese weapons of the 16th century. Interestingly enough, the Japanese not only quickly learned the craft of gun-making but also introduced several modifications of their own, including the safety mechanism of a pivoting pan that covered the priming powder. Unsurprisingly, many of the older Samurai clans looked down upon such seemingly cumbersome weapons due to their perceived lack of finesse. 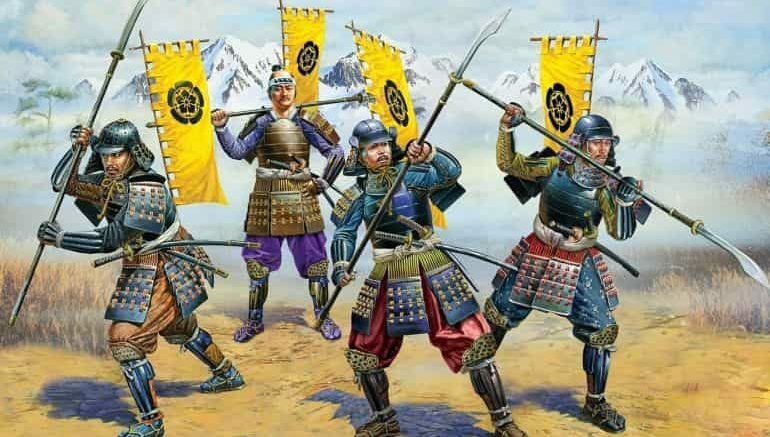 But at the same, many of the daimyo lords actively adopted the gunpowder weapons for their feudal armies, with one pertinent example relating to the 500 well-trained arquebusiers of Oda Nobunaga. It should be noted that Buddhism was a significant influence for most of the Samurai, so much so that even many higher ranking Buddhist clergy members were part of the Japanese warrior caste. On the other hand, it can also be hypothesized that many of the Samurai were only nominal adherents of Buddhism – and unsurprisingly so, as the ‘peace-preaching’ religion tended to come between their violent martial and food habits. To that end, while the rice was the staple food for all social classes (koku, the rice volume, was used as the primary unit in the economy), the Japanese warriors didn’t really shy from their fair share of protein consumption, in the form of pork, boars, and rabbits. While on campaigns, such hunted stamina food items were complemented by field rations comprising pre-cooked rice (in the form of onigiri rice balls) that could be instantly boiled for consumption. Talking of campaigns, given Japan’s mountainous features, supply lines and logistical attributes often took a back seat in favor of localized military actions. In some cases, as means to put less pressure on the baggage trains, the soldiers had to wear their full armor during the marching. And since leather armor was prone to infestation by lice and vermin, the Samurai dealt with such issues by smoking them tepidly over fire. In that regard, many short-campaign routes were planned to be in proximity to natural springs and hot spas, while soldiers were medically treated in a rather rudimentary (albeit sometimes effective) fashion. Mirroring such confined strategic scopes, the late medieval Japanese armies were rather conspicuous in avoiding temporary tents and pavilions when making their camps. One of the reasons probably had to do with the already present network of monasteries and temples across provincial lands that did provide some form of shelter to the camping armies. For example, the generals, lords, and their rich retinues often took quarters inside the temples. On battle eves, elevated defensive sectors (‘guarded’ by curtains) known as honjin were established – from where generals could direct the formations and maneuvers of their troops. Over time, such honjin were converted into lodgings and inns for the military officials. 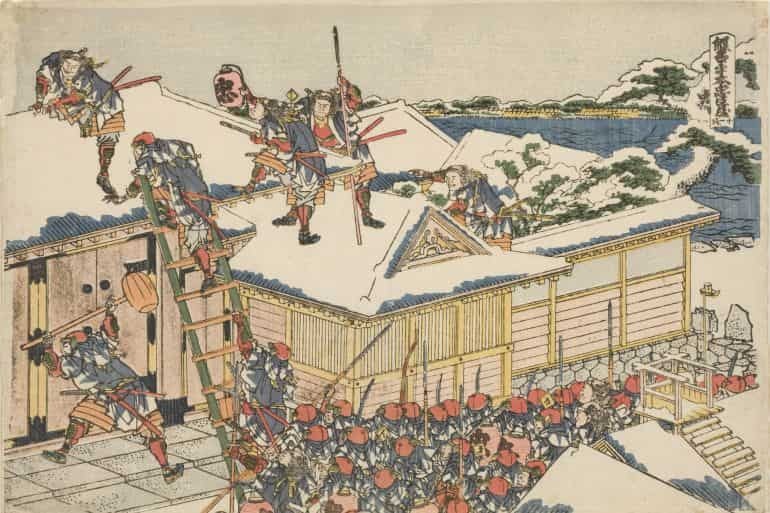 In contrast, the regular Samurai and the lesser infantrymen were billeted in the surrounding buildings, stables, farmhouses, and even in makeshift hovels by the trees. 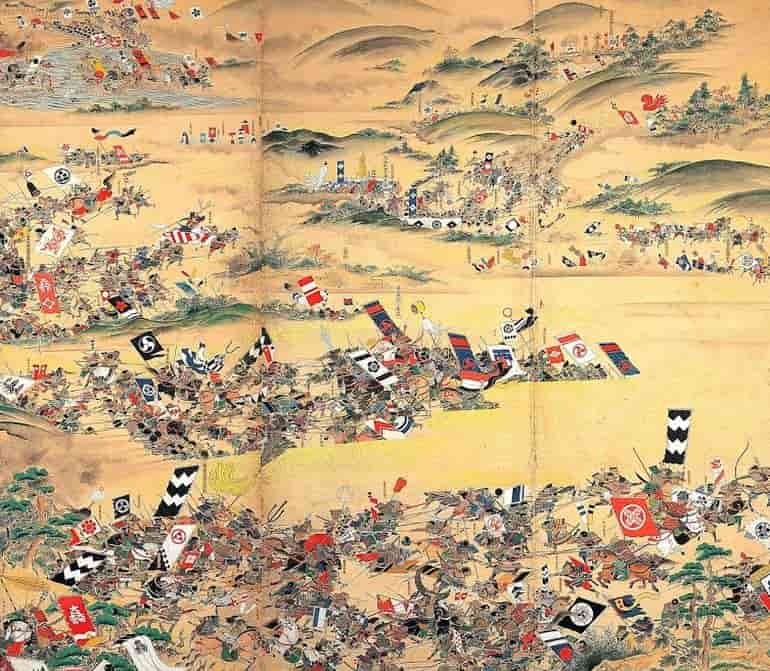 For all the cultural finesse and martial codes, the battle tactics adopted by the medieval Japanese armies were surprisingly simple, with the frontal assault on the battlefield being the preferred mode of engaging the enemy. Like most battles of the era, the engagement was started by skirmishing from the front ranks – that inevitably involved the archers and later the arquebusiers (who were increasingly becoming more effective with their focused firing maneuvers). After the customary volleys, the lines met with their bristling spear points, thus once again signifying how the yari (lance) was the standard weapon of the infantrymen. Within such a scope of massed infantrymen, the commanders had to gauge the flow of battle and act on the momentary windows of opportunity for counterattacks, defensive maneuvers, and flanking charges. And this is where the cavalry and elite infantry like the Samurai came to the fore, with the latter often used as the melee-assault force who emerged from the screen of archers to push back the enemy. Quite intriguingly, the medieval Japanese armies tended to shun siege warfare in favor of open battles, possibly due to the smaller feudal scale of the conflicts and the lack of conventional artillery (like effective cannons) that could take on the castles of the shogu and daimyos. In that regard, typical siege battles were conducted by the front rows of archers or arquebusiers who disparately fired their weapons at the defenders while being flimsily protected by wooden planks and screens. In spite of such seemingly disorganized actions, the defender’s position was also precarious over time, mostly due to the segregated nature of supply lines in Japan. Simply put, siege encounters were often decided by time as opposed to tactics, with defenders either forced to sally out and make a last stand against the besiegers or unceremoniously surrender because of lack of food and supplies. We fleetingly mentioned the hierarchy that existed even within the Samurai ranks. To that end, the younger (or lowest) members of the estate or castle garrison communally lived inside barrack-like establishments. Their married counterparts were allowed to reside in separate spatial arrangements, much akin to married quarters. 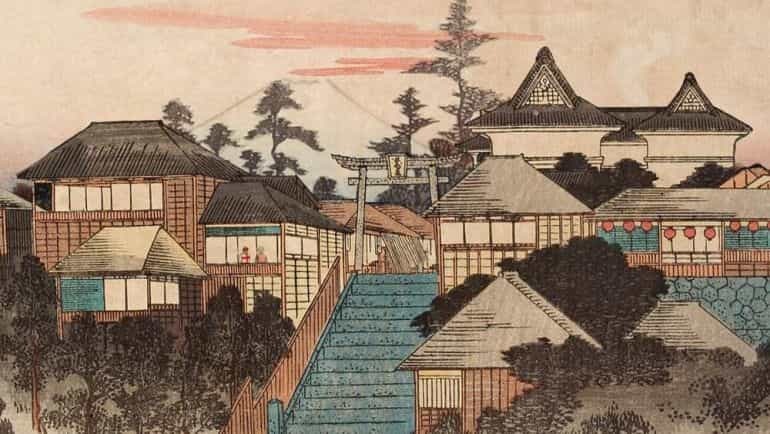 As for the senior Samurai, they and their household often lived in bigger residences, all located within the confines of the large estates or fortifications. Coming to 16th-century recreational activities of Japan, the Samurai were known for their penchant for gambling, especially card games, although the practice in itself was ambivalently discouraged by their clan lords. Some newer clans however reserved harsh punishments, including even death, for perceived ‘softness’ of character, like gambling and attending plays. Other forms of more ‘physically-demanding’ pastimes included a form of wrestling similar to sumo. Often times, such wrestling matches turned into spectacles where money was wagered by outsiders. And interestingly enough, many of the Samurai were also fond of tobacco after the European trade contacts, as could be evidenced from their use of kiseru pipes. Beyond gambling and wrestling, some of the Samurai clans were also known for their dabbling in high art forms, ranging from poetry to playing flutes. Pertaining to the former, composing poems were seen as mental exercises and as such generally entailed tanka – comprising five lines. These ‘high status’ poems differed from the senryū – the forte of the common soldiers that involved comical narratives with bawdy outcomes. 17th-century Samurai Yamamoto Tsunetomo of the Saga Domain put forth his famous axiom – “the way of the Samurai can be found in death”, thereby exemplifying the perceived nature of honor and duty in the erstwhile Japanese society. To provide a few examples, actions like failing one’s lord, bringing oneself into disrepute, or even allowing oneself to be taken prisoner by rival clans, were seen as fates worse than death. In that regard, the bushido made the case for seppuku (also called hara-kiri in English), a form of ritual suicide, that was basically seen as the means to ‘preserve’ one’s honor even after his/her revealed failing (on the line of duty). 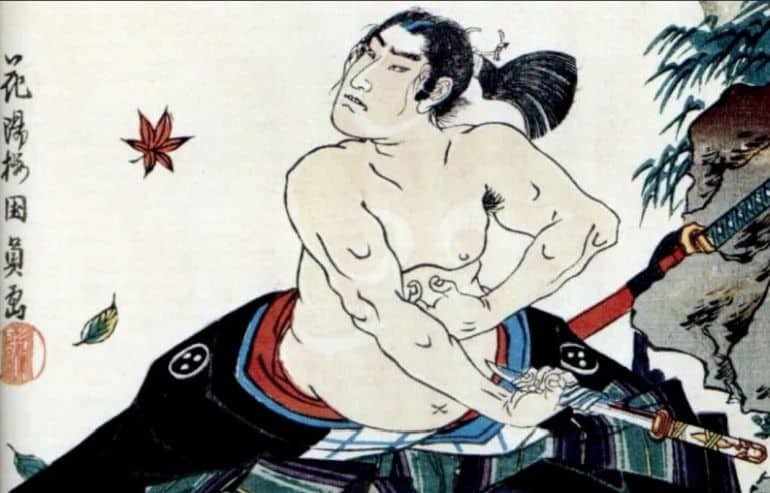 Steering clear of the gruesome details of the spectacular forms of seppuku, the affair was usually a very painful one with traditional cuts being made in a horizontal manner below the navel (sometimes followed by a vertical upward cut from the very same area). In most occasions, a second retainer waited behind to decapitate the person for a merciful quick death, but such time-consuming ‘ceremonies’ were not available to the warriors after defeats in battles. Samurai women also performed their own version of seppuku known as the ojigi that entailed the thrusting of dirks directly into their throats. 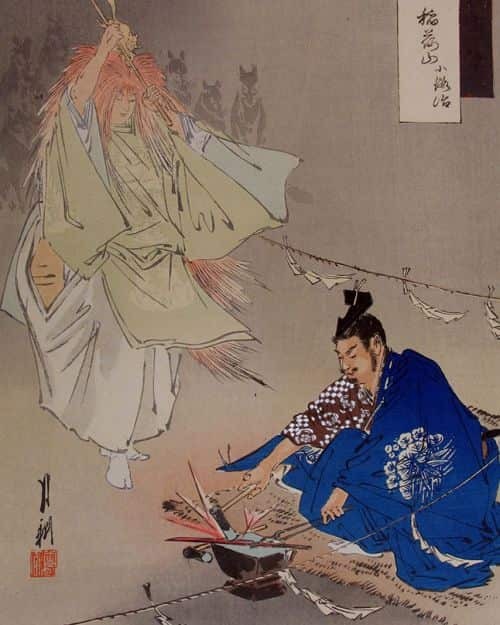 But even more grim (at least to our modern-day sensibility) was the practice of junshi, wherein the clan retainers and followers of the deceased lord voluntarily committed suicide to reinforce/showcase their ties of loyalty. One particular example relates to an incident in circa 1651 AD, when thirteen Rōjū (Elder Counselors) of Shōgun Tokugawa Iemitsu committed seppuku after his death, thereby creating a political vacuum in the administration. Suffice it to say, such actions didn’t bode well for the functioning of the feudal governments and the power of the heir lords, primarily because of the loss of their influential retainers. In fact, there have been statutes put forth by Shoguns themselves (like that of Tokugawa Ieyasu) that strictly forbade the practice of junshi, thereby somewhat limiting the overtly ardent (and often fatalistic) tendencies of some Samurai. We should also note that seppuku was sometimes prescribed as a form of ‘hidden’ punishment for the defeated generals by their victors – as was the case when Hideyoshi forced daimyo Hōjō Ujimasa to commit suicide after the Siege of Odawara in circa 1590 AD.